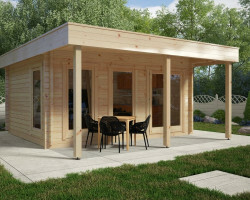 Garden rooms, garden offices and other garden buildings are gaining more and more popularity all over England, Scotland and Wales. 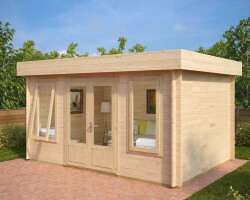 This has led to customers expecting more and more design solutions from retailers. 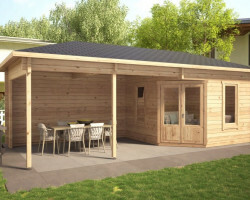 Modern looking summer houses and other contemporary garden buildings have been the fastest growing trend over the last few years. 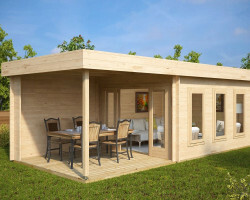 The way you dress, home décor, as well as the technologies and accessories you buy have always been a way to express your taste and approach to style. 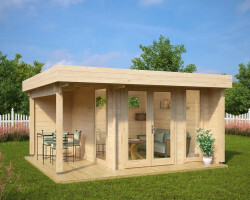 The cabin in your backyard should not be an exception. 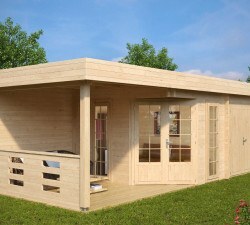 Besides, wooden garden buildings give you so much more flexibility to personalize it after it has been installed. 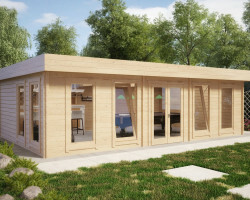 Just let your fantasies run wild when choosing colors, interiors, accessories and other outer and inner design components. 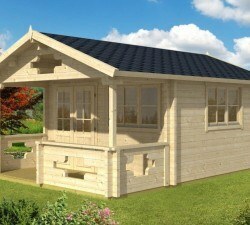 Times, when so many garden buildings were looking so similar are in the past! 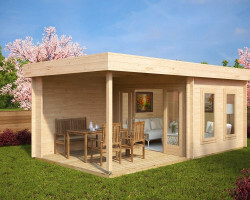 Advances in wood processing technologies enable us, as log cabin manufacturers, to supply hundreds of design solutions, while keeping prices affordable. 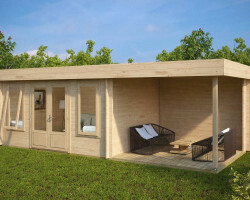 Generally speaking, a contemporary outer look does not affect the cabin price. 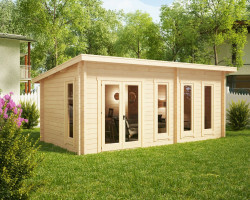 The major price components of a garden log cabin are the size of the building, wall thickness and other details. 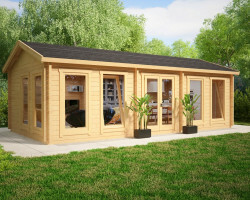 To design a modern summer house, we love to use a flat roof type and larger windows. 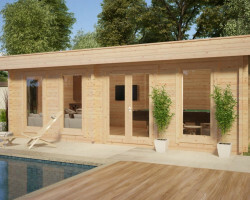 We use mostly French doors (double doors) and sliding doors for contemporary garden buildings. 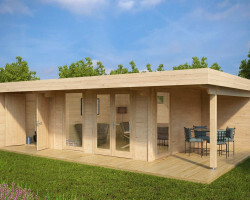 These components help us to achieve a NEW outer look to a garden building and add a light and airy feeling inside. 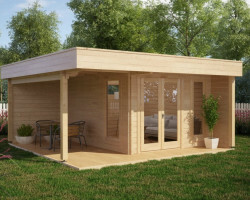 Many of our contemporary garden rooms come with large verandas and terraces. These features are very useful to add some extra elegance and design in addition to increasing comfort and functionality of your cabin. 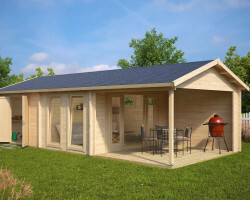 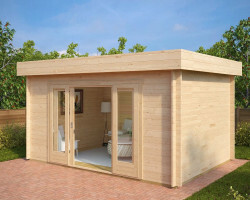 To combine a summerhouse with a shed in one garden building will enable you to store your garden furniture, BBQ and other garden equipment in a space saving solution. 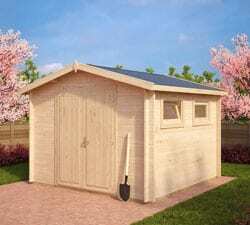 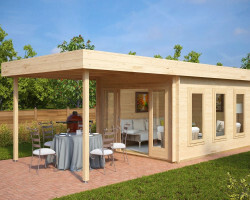 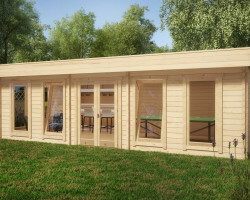 You may like our multi-functional garden buildings, many of them with a modern look. 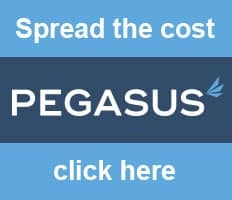 As they say, a picture says more than words! 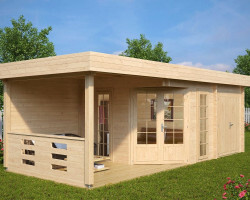 Here are good examples of our bestselling traditional and modern summer houses. 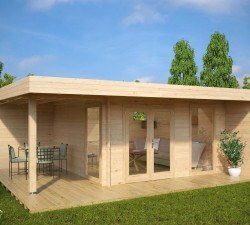 When it comes to installation, there is no difference between a modern summer house and a traditional garden building. 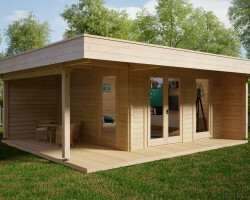 They are all self-assembly log cabins that can be erected within 1-3 days, depending on your skills and the size of a cabin. 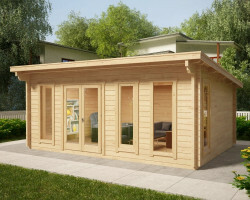 When choosing your “right one”, design is important and it matters, but while using your sense of beauty, don’t forget about the right size, wall thickness and other practical issues. 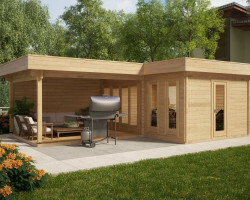 At the end of the day it all comes down to your own taste and preferences. 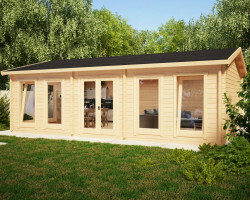 If a modern looking summer house is not your cup of tea, we have plenty of nice looking traditional garden log cabins for you. 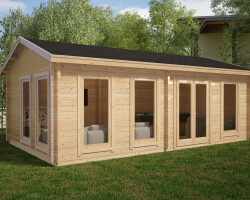 Our goal is to satisfy as many needs as we can, but maintain quality, comfort and ease of installation.